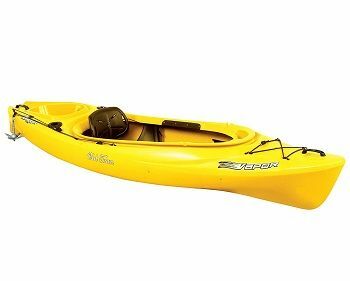 Old Town 10-Feet Vapor 10 Angler Kayak is compact and easy to operate. So far, it is rated among the best options you can get on the market. The unit is designed with the angler's comfort in mind. It is best suited for anglers who carry a load when they go on a fishing expedition. This unit has a spacious cockpit and a well-designed dashboard that makes it easier for the angler to control the kayak. If you join fishing as your hobby, whether you are young, middle-aged or old, the old Town Vapor kayak is a vessel you should consider owning. It is designed to make recreational fishing efficient, exciting and comfortable. The Old Town 10-Feet Vapor 10 Angler Kayak is a sit in a boat that features a roomy cockpit that guarantees the angler enough space and plenty of other amenities. The boat comes with a molded-in cockpit dashboard, molded-in paddle park, molded carry handles, a drain plug, stern day well, 2-rod holders, an anchor with a trolley system, and a deck bungee. The boat is well designed with adjustable foot braces and is 10' long. It has a width of 28.5'' and cockpit space of 19.5" x 48. The boat is intelligently designed, and it case shows quality workmanship. The unit has a well-designed dashboard with two cavities molded with a cup holder. The seats are heavily padded and comfortable. 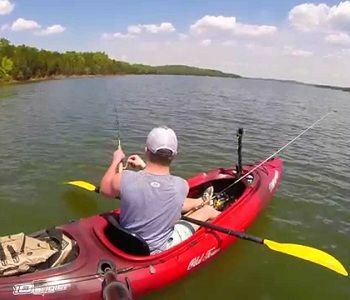 This is one of the kayaks that come with a comfortable and spacious cockpit that allows the angler to get in and out with ease. It weighs 49lbs and can carry a maximum weight of 12.5kg- 149kg. It is a well-known fact that long kayak hulls are faster compared to their short counterparts. One of the reasons that make them move fast is that they have a longer waterline length. In this breadth, Old Town 10-Feet Vapor 10 is 10 ft. long and its width is 28.5". The unit is moderately long and less maneuverable. However, it is relatively narrower and has a reduced wetted surface. The unit has less initial stability but compensates for this by having an enhanced secondary stability. The hull is designed to handle rough sea with ease even though it may face instability issues if deployed in the fresh water. 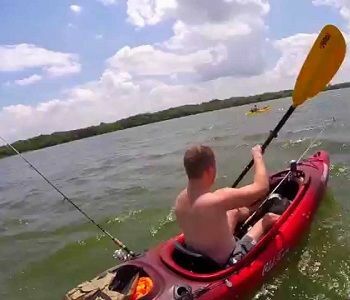 Nevertheless, it is one of the units you should consider buying if you are looking forward to the fastest kayak or if you ply your fishing trade in rough waters. The more a kayak's hull curves up from the center, the more the rocker it is said to be. The Old Town 10-Feet Vapor 10 is a high degree rocker and is curved along the keel. The unit tracks fairly well and is easy to turn it around. The unit is significantly fast because it has a less wetted surface area but requires a rudder to ensure that it is kept on course. The canoe is solidly constructed and is a good sit-in 10' kayak that tracks well and allows you to make good paddling across the lake. The canoe performs pretty well even in strong wind and is more spacious. If you a new angler, you may need to paddle the unit to the shore to access anything in the storage. Also, the cup holder that is molded in front is not within reach, and so you need to be a little bit careful. The type of construction a kayak feature is an important aspect that anglers consider before buying the vessel. The Old Town Vapor 10' is constructed from strengthened polyethylene. The unit manufacturer combines the strong features of polyethylene to come up with a heavy type of kayak that is an excellent choice for anglers who ply their fishing trade along the rocky shorelines and oyster beds. The unit has additional features such as built-in thigh pads and adjustable foot braces that make it rank among the best kayaks out there. The construction gives it increased stability, makes it comfortable, and increases the unit's immunity to capsize. Also, the construction leaves anglers with more space in the open top cockpit and allows them to get in and out of the unit easily. How a kayak is propelled is a key factor to anglers because it determines where and how he will use the kayak. We have different methods of propulsion; there is the leg powered kayaks, predator PDL, propeller/pedal drive, and an electric motor powered kayak. The Old Town Vapor 10' Kayak is pedal driven and features a trigger and foot braces. This ensures that the angler is secure and allows for efficient propulsion. It comes with a seat that can easily be adjusted to allow for forward movement and gives the angler an advantage when battling the catch of the day. The unit features foot pads that increase traction and thigh pads that ensure the angler is comfortable when fighting the catch of the day. Also, the unit features a drain plug, which ensures that the vessel is drained even when punching through surf and waves. The Old Town Vapor 10' Kayak is a high degree of secondary stability since it comes with a narrow beam which makes it one of the fastest kayaks on the market. The unit is fast and is best suited for experienced anglers. Unlike a high degree of initial stability vessels that can only be used to fish in still water, the Old Town Vapor 10' Kayak is designed to be used for fishing in unprotected inshore waters and can be used to fish in offshore waters as well. 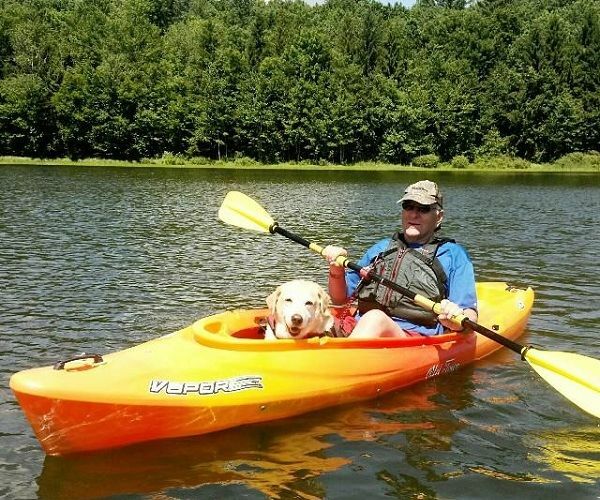 The Old Town Vapor 10' Kayak is a recreational fishing kayak that can be an excellent choice for anglers looking for a comfortable vessel that comes with greater stability and which is conveniently designed.